Andrew Baggaley had to beat every previous World Ping Pong champion en route to his third crown on Sunday. 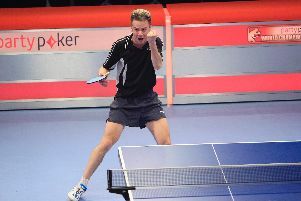 The MK player completed his hat-trick of Ping Pong titles as he overcame reigning champion Wang Shibo 15-10, 12-15, 15-8, 10-15, 15-6 in front of a packed crowd at London’s Alexandra Palace. The 2015 and 2016 champion came through Maxim Shmyrev in the last 16 and Yan Weihao in the quarter finals before beating China’s Chen Jie – the first woman to reach the final four of the tournament. Struggling with hand cramps throughout the final, Baggaley went into the final game with it finely poised at 2-2, but simply blew Shibo away 15-6 to claim the title which he said was the best of all his titles. “It is the greatest of my wins, definitely," he said. "There are so many amazing players and to beat Maxim, who played very good all weekend, and the top Chinese players, it’s unbelievable and this is my biggest win for sure. “Wang pushed me to the limits in the final but I am so happy. He threw everything at me and I threw everything at him and in the end in the fifth set ran away with it a bit, but he is so solid and doesn’t miss – you can’t get it through him. "It is the best atmosphere I have ever played in, it was unbelievable. It has been an amazing event and I am so delighted to have won it for a third time. It is a big achievement and I am thrilled."